Don't think just white sand beaches and sparkling lagoons. 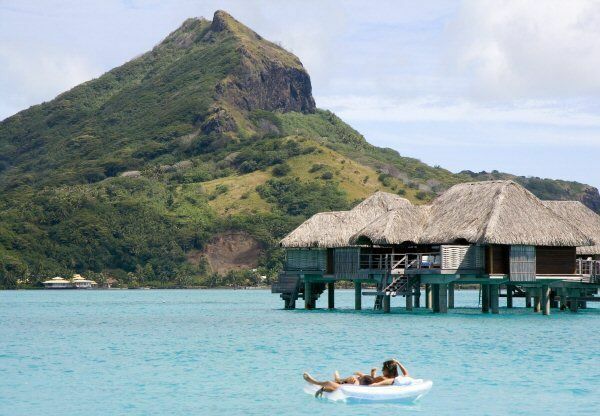 A family vacation to Moorea and Bora Bora offers special, once-in-a-lifetime experiences. Jumping off your overwater bungalow’s deck into popsicle blue waters isn’t the only cool thing kids love to do in French Polynesia. Bouncing along in a Jeep past old WW II canons, petting stingrays and paddling an outrigger canoe also top the list. 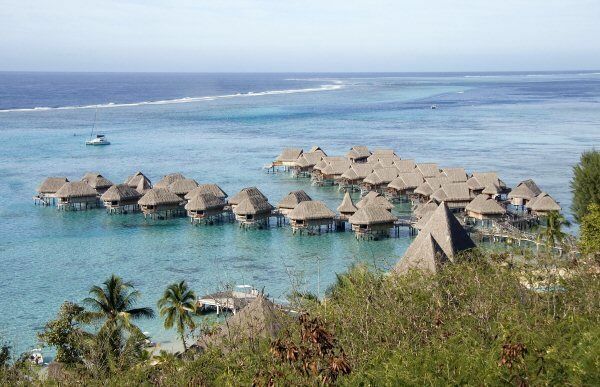 Moorea and Bora Bora (the nation’s two most popular islands) may be honeymoon hot spots. But this tropical South Seas paradise also welcomes families. And while not cheap – after all, it is one of the most gorgeous spots on earth – there are places to stay that are wallet-friendly and family beach vacation deals to tempt you. All international flights to French Polynesia actually land in Papeete, Tahiti, the capital, where most visitors overnight. A lovely place to rest up is the InterContinental Tahiti Resort, five minutes away from the airport, with a sandy beach fronting a snorkeling lagoon, two pools and 30 acres of gardens. A renovated room with two queen beds, huge marble bathrooms and panoramic lagoon views can accommodate a family of four. Refreshed, you’ll be ready to move on from Tahiti to the other Society Islands. From Papeete, take a 30-minute, high-speed catamaran ferry to reach the lush heart-shaped island of Moorea. This is the place for superb snorkeling. Baby moray eels. Leopard rays. Blue-banded Picasso triggerfish and pumpkin orange clownfish. If “Finding Nemo” is one of your family’s cherished flicks, then the Sofitel Moorea Ia Ora Beach Resort is the place for you. Our lagoon-view bungalow was mere steps away from Nemo’s world. While Moorea doesn’t have the colorful corals of the Caribbean, it does boast a stunning variety and abundance of tropical fish. And the snorkeling at the Sofitel is superb. 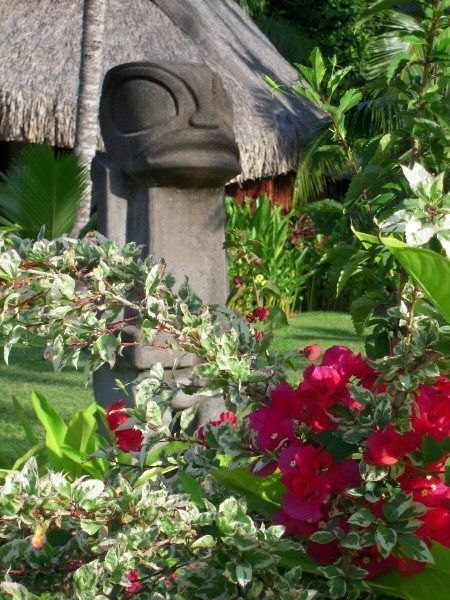 The resort itself is spread out over a beautifully landscaped property with lily ponds, sacred stone marae statues, and the island’s best powdery beach. No blaring pool music or jet skis mar the tranquility. There are 114 bungalows, 12 of which are lagoon-view and have a king bed and sofa bed (accommodating three). Several evenings a week, Polynesian shows provide entertainment during dinner – kids particularly love the fire dancing. If there are four of you traveling, you can opt for the Moorea Pearl Resort & Spa, where family garden rooms, with a little second mezzanine floor, sleep up to four. Stingrays have the softest, silkiest skin. So your kids will discover on a motu (tiny islet) picnic and ray feeding tour with Mahana Tours. We were taken by boat to an uninhabited sand-fringed motu, where our Tahitian guide Terry has trained some 13 stingrays. These are wild rays that swim free but are attracted to the fish Terry feeds them. As you kneel in the water, a ray is enticed to glide up to you and practically rub your tummy. You’re told to caress the ray with both hands from the top down to the outside wings. 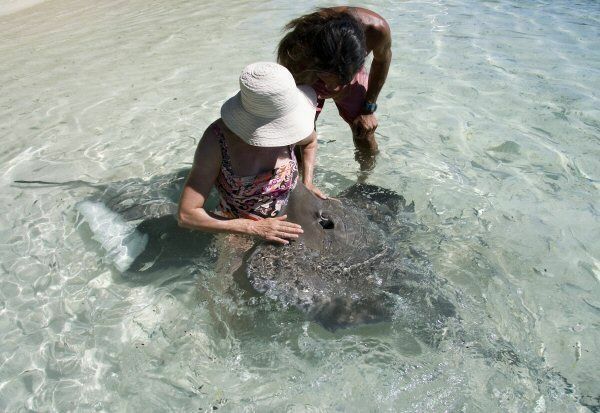 It’s disconcerting at first when two or three rays try to virtually hug you, but the experience of petting these incredibly soft creatures is so amazing that you quickly become comfortable around them. Terry also assures you that they won’t sting (rays only sting when threatened). The whole tour is “untouristy” and feels very natural and authentic. If your tour includes an added lagoon cruise in a small powerboat, chances are you’ll see spinner dolphins too. They love to play and zig-zag in front of the bow of your boat. One dolphin even leapt right out of the air for us, and with its nose pointed skyward, twirled around before splashing back down. 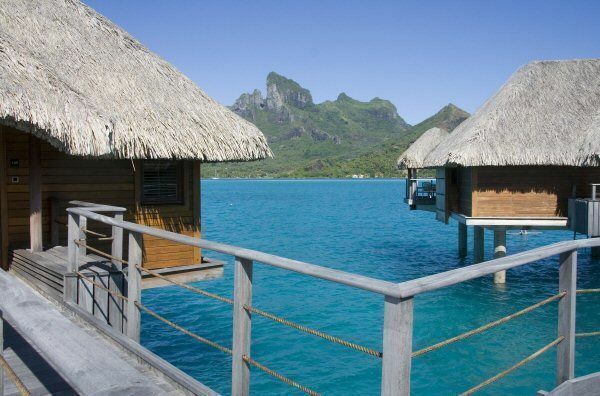 Bora Bora, Blissing Out in Overwater Bungalows! A short flight or helicopter ride from Moorea brings you to Bora Bora, declared the most beautiful island in the world by author James Michener. 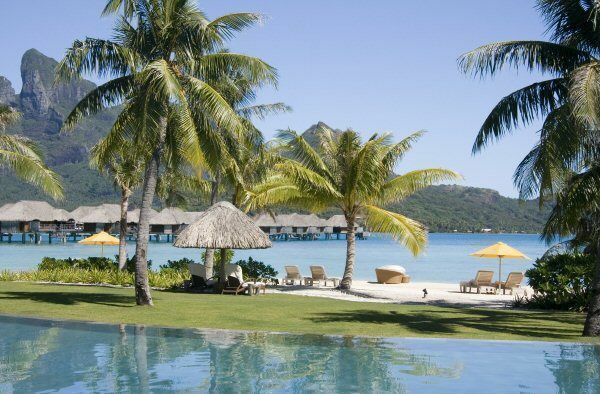 Set on a secluded motu in the lagoon encircling Bora Bora, the new Four Seasons Resort Bora Bora is worth the splurge. You could book a two- or three-bedroom beachfront villa, with its own private pool and hot tub. But for a truly special stay, choose one of the 100 thatched-roof wood bungalows perched on stilts over the lagoon (hey – there aren’t many places in the world where you get to sleep overwater). Each bungalow measures 1,100 square-feet and can sleep up to five, with a king bed or two queens in the bedroom and a queen sofabed in the living room. Separating the two rooms, a huge bathroom features glass panels in the hardwood floor (spot a fish anyone? ), a double stone tub facing the sea and luxe L’Occitane shower products. Decorated with coral lamps, glass-framed shell necklaces and other indigenous artwork, they are cool, restful and exquisite. Best of all, they boast large shaded decks with a ladder descending right down into that warm shallow turquoise water (only waist-deep for bungalows close to the beach). If your children love to swim, you’ll be hard-pressed calling them back in! Then again, they might be tempted by the infinity pool, cushioned pool cabanas (big enough to play cards in) or two tennis courts. For sure, they’ll want to feed the octopus in the resort’s inner lagoon sanctuary. Led by an on-staff marine biologist, the sanctuary is where kids can enjoy guided complimentary snorkeling tours, learn all about coral grafting, feed the fish and more. This resort gets the teenage mindset and has an excellent facility for them – Chill Island – where teens can hang out in their own clubhouse or on a private beach with ice cream parlor. No-obligation activities range from racing across the lagoon in outrigger canoes to learning Tahitian dance and drumming. You could quite happily stay put at the Four Seasons, but it’s worth venturing out in the resort’s teak speed boat to explore Bora Bora itself. Complimentary resort bicycles await at the Four Seasons dock if you wish to pedal around the island’s breezy 19-mile ring road, stopping at the outdoor Lagoonarium to swim with sea turtles. Feeling adventurous? Then discover the island’s hilly interior by jeep with Tupuna Safari. It’s a bone-jarring ride on rutted dirt tracks – we got a workout just hanging on to the roll bars – so this three-hour excursion is only suitable for older children. But you get to pick wild fruits from bananas to mangos, check out massive 20-foot cannons left behind by the Americans after WW II, and admire sweeping views of the Pacific from hilltop vantage points. You end up at a black pearl farm called The Farm – where dad may even buy mom a little memento to take home. For more information on these gems of French Polynesia, and seasonal deals at these and other properties, visit Tahiti Tourisme.